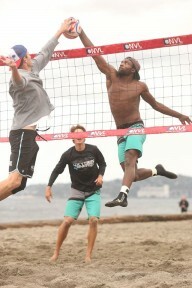 Rain and 50 mph winds couldn’t stop the NVL pros from giving it their all out on the Alki Beach sand in day one of the Seattle Championships main draw matches. The competition was fierce with plenty on the line as teams fight for a spot in the Players Championships, which will close out the 2015 season next month. Heading into the quarterfinals today, No. 1 seed and Hermosa Beach champions, Dave Palm & Eric Zaun will face No. 4 seed Skylar DelSol & Piotr Marciniak. Looking for another upset after beating No. 2 seed and Midwest Championships winners Andrew Russell & Travis Schoonover, No. 7 seed Drew Mallin & Ryan Vandenburg. will take on No. 3 seed Mike Placek & Jeff Samuels. In the men’s contender’s bracket, it’s No. 5 seed Mike DiPierro & Jon Mesko versus No. 8 Philip Burrow & Matt Henderson, and No. 6 Skyler McCoy & Mark Williams against No. 13 Matt Clayton & John Michael Plummer. Panama City Beach champions, No. 1 seed Brooke Niles & Karolina Sowala are looking for their second title this season against No. 5 Meghan Mannari & Taylor Nyquist. No. 6 Molly Menard & Michelle Williams have a tough match against the women’s reigning champs of Vivian Cunha and Raquel Ferreira seeded No. 2. The women’s contender’s match-ups include No. 4 Chara Harris & Brittany Tiegs versus No. 14 Megan McNamara & Nicole McNamara, who once again made it out of the qualifiers to get a main draw appearance in only their second NVL pro tournament. No. 7 Kim Hildreth & Megan Rice will have to overcome No. 3 Chelsea Hayes & Jennifer Snyder to keep their hopes alive. NVL is also hosting a free Clinic with the Pros on Sunday at 1 pm. Juniors will have the chance to get coached and learn basic volleyball fundamentals by top NVL professional beach volleyball players. Center court matches will be aired live at 10 am PST for free at TheNVL.com/webcast. 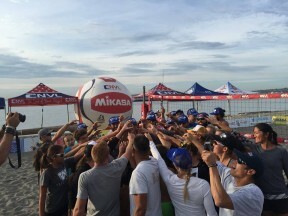 The official tournament hashtag is #NVLSEATTLE.